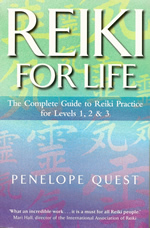 This is a big Reiki book. It is a comprehensive guide from the Reiki basics to advanced traditional Japanese Reiki techniques. Plenty of illustrations make learning the hand positions and other techniques easy, and the large volume of material means that with a bit of practice you will soon feel both competent and confident in your newfound Reiki skills. additional techniques from the Japanese tradition, becoming a practitioner. Health warning: Reiki is a complementary health method. It should not be used in place of traditional medical care. Information on this site is given according to our best knowledge and experience. Each person uses this information at his or her own risk. We will not be held responsible for any alleged negative results that supposedly follow from the use of this information.